African Hoopoe has rich chestnut colouration, contrasting with black and white stripes on wings and tail. Underparts are reddish-brown. Head and back show the same colour. Broad rounded wings are heavily marked black and white. Square tail is black and shows a white wide band. 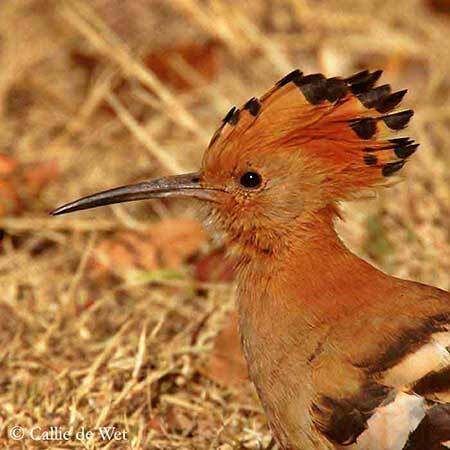 Head has a conspicuous crest, made with long chestnut feathers, with a bold black tip. This crest may take two forms, according to the moment. It may be as held straight, or erected in a rounded crown. Dark bill is long, slender and down-curved. Eyes are dark brown. Legs and feet are brownish. Female is duller than male. Immature resembles female with shorter crest. African Hoopoe differs from Eurasian Hoopoe (Upupa epops): male African Hoopoe has richer colour above, it lacks the sub terminal white band on the crest, and has black primaries. Female of both are similar. They are two separated species. African Hoopoe’s call is a distinctive “hoo-poo” repeated 3 to 5 times or more. African Hoopoe lives in open and brushy areas. We can find it in parks and gardens, thornveld and riverine woodlands in dry areas. African Hoopoe is distributed in Europe, Tropical Asia and Madagascar. It lives in Africa (of course) where it is widespread, except in western and central equatorial lowlands forests. African Hoopoe forages on the ground, probing the leaf-litter with its slender bill. It walks easily and may run, with some movements of the head, and stopping frequently to probe, dig and pick food off the ground. It snatches up insects in its long bill, and before to eat, it beats them on the ground to remove legs and wings. Then, it tosses up the prey and catches it in its open bill. African Hoopoe’s crest is depressed when at rest or quiet, but when it is alarmed or excited, crest erects in beautiful circular shape. African Hoopoe is monogamous, generally found singly or in pairs. They nest in cavities, and they are notorious for their dirty nests: repugnant smell, dropping not removed, and these birds produce a foul-smelling secretion from an oil-gland. 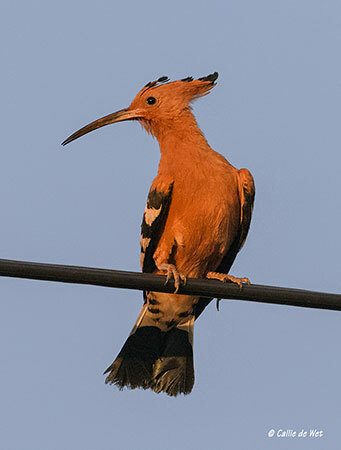 African Hoopoes are migratory in some parts of their range, but other populations are sedentary. If a Hoopoe is threatened by a raptor, it flattens itself against the ground, spreading wings and tail, and bill pointed straight up. 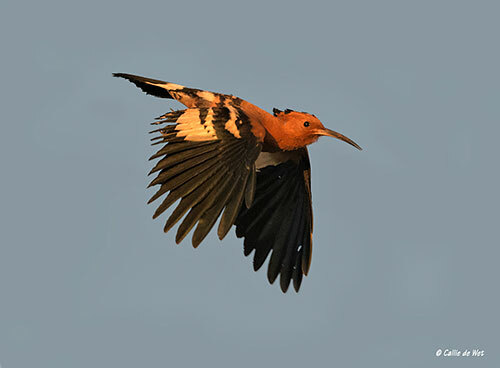 African Hoopoe has an undulating and erratic flight, as a butterfly. It has strong flight, with irregular wing beats. 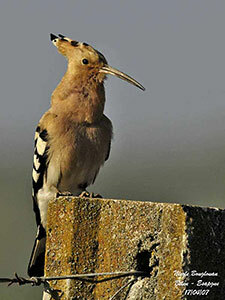 Hoopoe can soar very high to escape a raptor, but usually, it flies just above the ground. 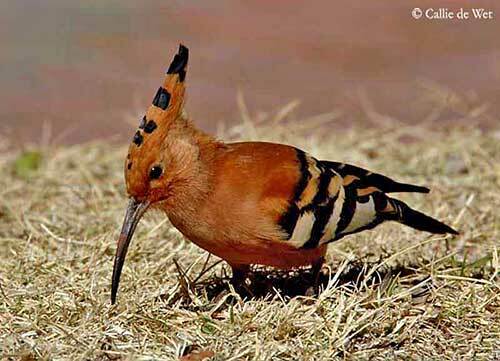 African Hoopoe feeds on insects and earthworms, but also frogs and small snakes and lizards. It may eat some seeds and berries, but in very small quantities. African Hoopoe has some predators such as birds of prey. Species is common and widespread in South Africa. 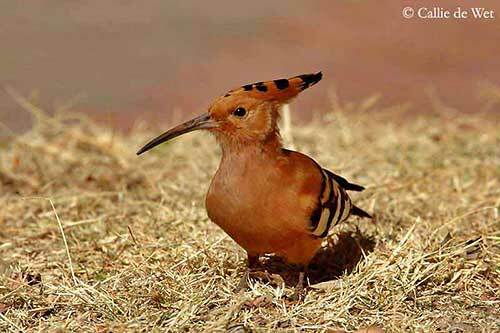 African Hoopoe is a solitary and cavity nester. Nest is situated in holes or crevices in tree trunks, but also in abandoned termite mounds, buildings, ground holes, under houses and nest boxes. It doesn’t excavate the hole itself. They may use the same nest site for several years. Male chooses the place. Nest may be bare, or slightly lined with grass or even debris and dry manure. Female lays 4 to 7 bluish or greenish white eggs, becoming quickly brown. Incubation lasts about 14 to 20 days, and begins with the first egg laid. Incubation is by female, fed by the male. But sometimes, she forages herself. Chicks hatch altricial, blind, with sparse long white down. Female stays one week more at nest, always fed by male, and then, young are fed by both adults. Young fledge at about 26 to 32 days of age. This species produces one to three broods per year.